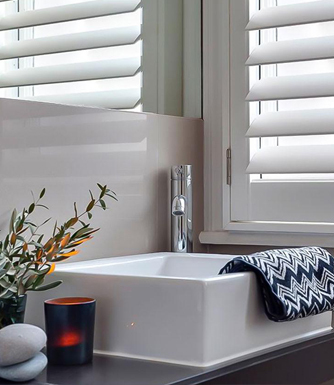 Our ABS Plantation Shutters in Melbourne, are perfect for wet and humid areas of the home such as bathrooms and kitchens. They feature a waterproof, UV-inhibiting finish to effectively block out light and harmful rays. Simple to use, the shutters can be easily adjusted to let in varying degrees of light, and privacy, which is important in areas such as bathrooms. They will also create ventilation, allowing you to control temperature, and keep your air fresh. Available in a range of colours including the classic white, our ABS plantations are strong enough to span large openings with a single panel group. The panels can be easily cleaned with just a wipe down with a wet cloth. Get in touch with out team to discuss how we can custom design and install ABS plantation shutters in Melbourne that are perfect for you.